The musical tells the story of Argentina's Eva Peron, who rose from the slums to the presidential mansion. 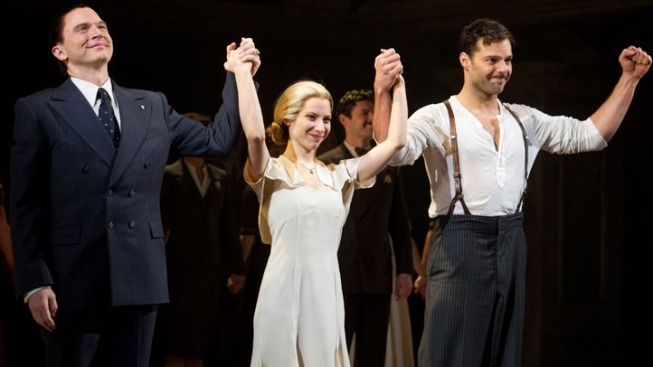 This March 12, 2012 file photo shows actors, from left, Michael Cerveris, Elena Roger and Ricky Martin at the curtain call after their first performance in the new Broadway production of "Evita," in New York. The Big Three in the Broadway musical "Evita" — Ricky Martin, Elena Roger and Michael Cerveris — will leave the show together after the Jan. 26 performance. Producers of the Tony Award-nominated revival of Tim Rice's and Andrew Lloyd Webber's landmark musical said Monday night the show will continue its open-ended run, and new stars will be announced at a later date. The revival opened on March 12 at Broadway's Marquis Theatre, directed by Michael Grandage and choreographed by Rob Ashford. It has broken the theater's box office record seven times, but now faces a tough time filling its three main roles. The musical tells the story of Argentina's Eva Peron, who rose from the slums to the presidential mansion. Roger plays Eva, Cerveris her husband and Martin is Che.